Beautiful day at the Saturday Farmers' Market at the Ferry Building. We stopped off at Acme for a sour batard (our reason for the excursion) and an olive bread. After going out in back and tasting our way through cheese, peaches, tomatoes, dips and more, we left with a pot of garlic quark, some dry jack, some peaches, some dry-farmed organic early girl tomatoes, a large bunch of basil (with roots! I plan to harvest the basil and try to get the roots to re-grow up on the deck to replace the basil which has never taken hold), and a small jar of lavender sea salt. Spotted James Ormsby on our way back inside, checking out cheeses and other food stuffs. What the heck was he doing at a yuppie farmers' market, certainly not gathering the goods for his dinner trade? We finally decided he was probably there, killing time before Patricia Unterman's 1 p.m. book signing at Book Passage for the 4th ed. of her San Francisco Food Lover’s Guide. Our quark needed to be in the fridge. The smell of the basil was making me hungry, so we decided to skip the Unterman signing and head home. At Levi Plaza, before crossing Sansome and heading up the Filbert Steps, I realized that the day was perfect to take a picture of our place. 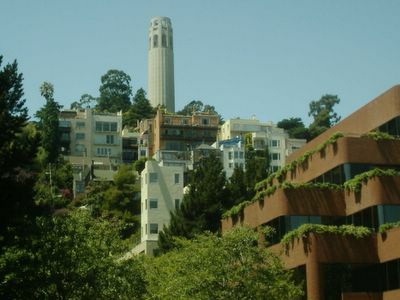 See the brick-colored building just beneath Coit Tower? It's not really just beneath Coit Tower. It's down on the east side of Montgomery, just north of the Filbert Steps. That, believe it or not, is a single family home. 10K sq ft. SEVEN CAR PARKING! Yowzaa. Just below and to the right of the zillion dollar home is our HSH, a typical 25' wide, lot-line to lot-line, San Francisco dwelling. The patch of blue is the east-facing wall of our deck. The brick building in the right front of the picture is part of the Levi Strauss & Co. campus. The off-white building just visible behind it is the Pearson Addison-Wesley and Benjamin Cummings building on Filbert, just below the Steps. Now that you've been given the grand tour, think you can spot the place from this angle? Karin Slaughter spotted at B&N this morning. House for sale! House for sale! Is anyone there? Hello? Is anyone there?